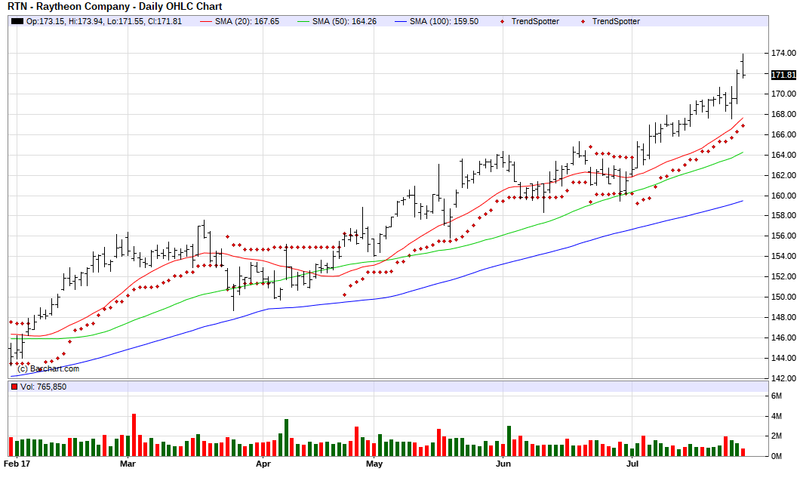 The Chart of the Day belongs to Raytheon (RTN). I found the technology stock by using Barchart to sort today's All Time High list first by the highest number of new highs in the last month, then again for technical buy signals of 80% or more. Since the Trend Spotter signaled a buy on 7/5 the stock gained 4.17%. Raytheon Company is a global technology company. The company provides products and services in the areas of defense and commercial electronics,engineering and construction, and business and special mission aircraft.Raytheon has operations throughout the United States and serves customers in numerous countries around the world.